Strangely, if there's one vegetable that I regularly crave, it's kale. So I was a bit disappointed the other week when two characters form my favorite TV shows totally bashed it! First, Kitty on Brothers and Sisters (I know, I know, I can't believe I'm still watching that show either. I promise I'm going to stop after this season) dismissively said she was sick of it, as though it embodies all that is wrong with boring, tasteless health food as against cheeseburgers and fries. And then on Modern Family (I frickin' love that show, no apologies), Mitchell complained that kale should be considered nothing more than a garnish! A garnish! My very favorite way with kale is steamed and served with this homemade teriyaki sauce. I know, it's random, and I know the sauce is meant for chicken, but I love, love, love it on kale. But if you're in need of something even simpler, this stir fry takes mere moments. 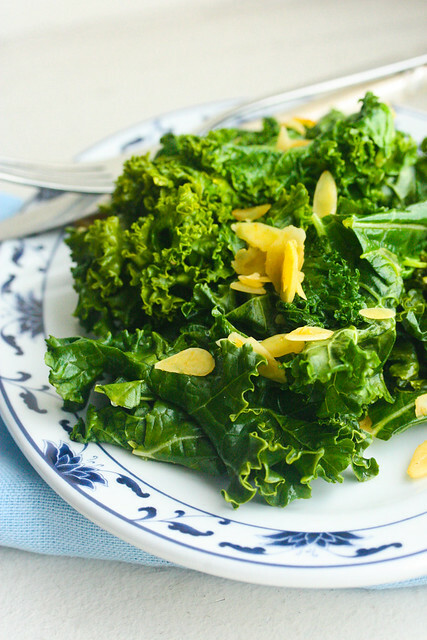 With kale and almonds sauteed in garlic and ginger. 1 teaspoon grated ginger, finely chopped. I'll admit that I ran out, and used a teaspoon of powdered ginger added with the almonds, but do for fresh if you have it. Heat the oil over medium-high heat in a large skillet, and add the garlic and fresh ginger. Cook for about 30 seconds, until it start to get fragrant. Reduce the heat to medium and add the almonds. Toast them for 1 minute, then add the kale and the broth or water. Wilt the kale for about 5 minutes, until softened, but not soggy. Serve. There was a ton of kale at the farmers market this morning but I didn't buy any because I had no idea how to use it in a recipe, problem solved! I will be stocking up on it next week and trying this recipe! Does it taste like spinach or lettuce? I am embarrassed to say I've never tried it. Elizabeth, it doesn't really taste like either spinach or lettuce. It's a deeper flavor than lettuce. I really love it, I crave it sometimes in fact. If you get a bunch, also try it with the sauce I mention in the post. It is wonderful.